Regular readers of this blog may shake their heads about yet another XO post. Man, I'm sorry, I guess I have gone off the deep end. I can't help it. I didn't plan what has happened. But I would not have missed a moment of this ride. I've tried to come up with catchy post titles so I could put this story in a logical order, like "Year of the XO, Part 1". Problem was, there was no logical order to what happened in my classroom this year with the XO laptop. As soon as I thought I knew where we were going with them, things changed. So the news has been pretty scattered. I'm not going to retell it just yet. It would be much too long, and frankly, the story is still being written. Yesterday, the fourth member of my classroom XO family arrived! Like the second and third, it was a donation. I'm absolutely blown away by the generosity and good will that has prompted people to do this. I'm so grateful for the chance to give my third graders the opportunity to expand their worlds and their thinking with these little green computers. Most people who bought an XO in the G1G1 program have one laptop. I was thrilled when I got mine. But I had no idea of its power and potential until I had more than one. They were designed to be used in groups. The next time you see somebody slamming the XO for being too slow, too user unfriendly, too underpowered - please keep this in mind. The built in collaborative potential is phenomenal, and many people just don't see that. You have to look them as a group. You need to use them in a group to really get it. I like to think of that group as a family. 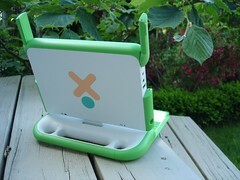 OLPC has called it The Neighborhood. This fall, we'll start the year with 4 XO laptops. I can't wait. Last year I brought mine in to school in January, got a donation a couple of weeks later, another a month later, and a loaner in late February. So we kind of made up our "xo program" as we went along. While we were figuring out how to work them and what to do with them, more appeared. Things were hit and miss, until late May when we participated in a pilot of a new piece of software for the XO with some UW students. That was for sure the cherry on top of the sundae. This summer I'll work on upgrades, try out new "builds" and "activities". And of course I'll come up with a way to teach my kids how to use them and show them what they can do with them. It'll be nice to have some time to work on the planning. One of the things I'm most excited about is using them as e-book readers. They are designed to be used in tablet form for this, and are super - a relatively large screen and excellent color display. I'm thinking a flash drive library of books, with several flash drives holding hundreds of books.... We'll see. I feel extremely lucky to have a chance work on creating new and unique learning environments for my kids that will challenge them in creative ways. Once again, to those who have donated and loaned their XO's to my classroom, I send you many, many thanks. Best of luck! Can't wait to hear! I look forward to your updates, so keep them coming. I've been following your progress from afar. 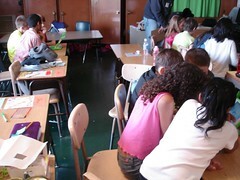 I only have one XO but my kids (sixth graders) were very interested when I brought it into the classroom. Intrigued -- better word.